I am a mom of fourteen month year old twins, and soon to be the mother of one more! I am having sort of a moral dilemma. I moved with my babies and have still not finished unpacking... and there are so many errands to be run. But I'm not sure how I feel about the idea of traveling in the car with my twins each day for so long... It interrupts our day and I know it can't be the best thing for them. I have tried only going once a week, sometimes twice a week if I can get help, but my house is still needing a lot of work and time in the car. Is there anything you suggest to make it better for them... I don't know, maybe this is a good thing that they are going out? If anything, maybe I can stop feeling like such a bad mother! Don't feel like a bad mom! Kids that live in a household where there is a lot of commuting and or trips to run errands, get used to it and it is not a BAD thing, you are not hurting their development... And it is a way of life for many families! So what are some tips to make everyone happier? Try to do an outdoor activity in the a.m., even though you have young ones, let them play outside for a while. Or if it is raining or too cold, play some lively music and have movement time. It also helps to have a routine, especially when your children are 2 1/2, they will crave order and routine (Montessori Sensitive Period for Order). So try to do your driving at the same time of day each day or every other day. You can also play tapes or CDs for them to listen to in the car, or sing preschool songs and nursery rhymes. I don't recommend giving them food to eat unless you are stopped in a parking lot in between errands and it is snack or lunch time. Kids can choke while eating and you don't want to be driving when that happens. Over the long term, your children will learn how to shop, go to the bank, and so forth, which is a plus! At least they won't be sitting at home in front of the TV! After returning home, when they get a little older (2 to 2 1/2) let them help you put things away, then they can have time outside to play and be active. And if they are doing a lot of sitting in the car, create "standing" activities at home: a water table, a rice or bean table, a block or train table, a play dough table. Also, get a small slide and put it indoors, buy a small trampoline when they are older, and so forth. Hang in there! Children are very adaptable, just try and follow their stage of development, and strike for balance! 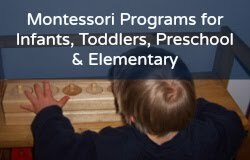 Want more Montessori for tots? 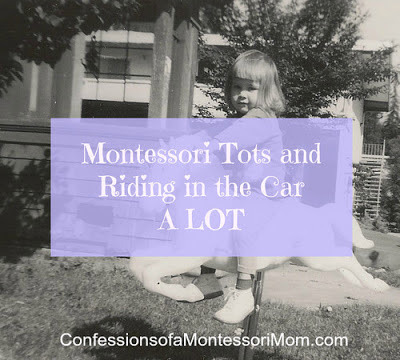 Read my other tot blog posts here! Check out my affordable online Montessori for birth to 24 months here and my recommendations for Montessori infant tot books here!